A business cycle or boom-bust cycle refers to the alternating periods of recession and recovery. Changes in production and trade in a market economy cause these alternating periods. We often use the term together with the economic bubble. Economic bubbles occur when prices soar far above their *intrinsic value, followed by a ‘burst’ when they fall. *Intrinsic value refers to the real value of a share, property, currency, or option, rather than its book value or market value. In other words, its true worth. 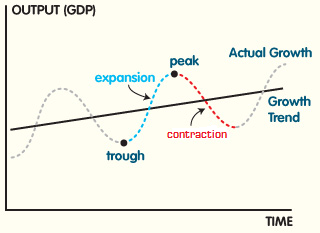 The business cycle refers to the periodic, yet irregular, fluctuations in economic activity. We measure those fluctuations by changes in real GDP and other macroeconomic factors. Although they are periodic ‘cycles,’ the changes in economic activity are extremely unpredictable. A key component of the business cycle is a recession. If a country does not experience a recession, then it will not have a business cycle. With no recession, there is just a long period of economic expansion. First, there is contraction, which means that economic activity slows down. Second, the economy keeps contracting until it reaches a trough. When it hits a trough, signs of an upcoming expansion start to appear. Third, an expansion begins to occur. In other words, economic activity starts to pick up rapidly. Fourth, expansion reaches a high peak, and there are signs of the economy contracting again. Economists try to find out whether the economy is about to experience a cycle. They also want to determine where the economy is heading. It is important to know when they are planning for possible negative future economic events. What do economists advise when the economy appears to be heading in a bad direction? They advise fiscal or monetary tools to try and steer it another way. Sismondi’s beliefs clashed with those of the classical economists. Classical economics is an economic school of thought started by Adam Smith which denied the occurrence of business cycles. However, Sismondi’s theories gained some traction when the first international peacetime economic crisis happened in the Panic of 1825. An economic crisis is a sudden and severe economic downturn. Sismondi and Robert Owen both shared their thoughts on business cycles in a Report to the Committee of the Association for the Relief of the Manufacturing Poor. In their 1817 report, they stated that the overproduction of goods and weak demand caused economic cycles. They also said that the wealth inequality was the cause of weak demand. The two economists were in favor of government intervention as a solution. However, the classical economists disagreed with them. Decades later, Charles Dunoyer developed a theory of alternating cycles. Economists say that Dunoyer’s based his theory on Sismondi’s theory of periodic crisis. If business activity in a major economy declines, and that contraction spreads internationally, there may subsequently be a global recession. The United States, for example, is a major economy. When a recession is over and GDP starts to grow again, unemployment typically falls. However, this does not always happen. When unemployment remains stubbornly high even when GDP is growing, we call it a jobless recovery. In the 1920s, Russian economist Nikolai Kondratiev proposed that there were super-long cycles about fifty years long. We know them today as the Kondratiev cycle.